Graceful lines, generous beam and widespread popularity. The split-level salon combines a roomy lower-level lounge area with a raised galley and dinette, while two forward staterooms provide comfort, privacy, and convenience for four with separate en-suite heads. Above decks, a large canvas-enclosed command bridge has ample seating for captain and passengers. Moving aft, the cockpit and swim platform get you close to the water level action, be it fishing, swimming or just relaxing in a lounge chair with a cooling drink. 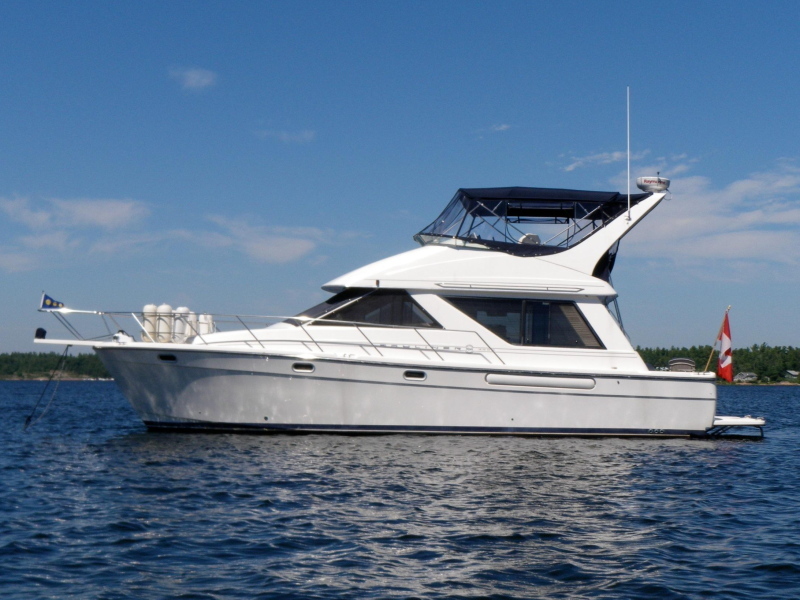 This Bayliner 3988 Motor Yacht has 1100 hours on the fuel efficient Cummins Turbo diesels. There are only 200 hours on the super quiet Northern Lights generator, which was installed in 2011 by the current owner. The combination of the Northern Lights generator, the Xantrex inverter/charger and the enhanced electrical monitoring and control system, make this a very comfortable live-aboard yacht away from the dock. A well appointed and tastefully decorated interior, updated electronics and a long list of recent upgrades, make for great value in a very popular sedan bridge cruiser. Vessel located off-site … please call ahead for appointment.